We have been super-excited for Lindsay & Ethan’s wedding since the very first day we met with them. At that time, they described to us their plans for a unique urban wedding that immediately perked our ears. They decided to hold their ceremony and celebration on the rooftop of a parking garage in Portland’s Pearl District, with a commanding view of the river and downtown. A little unconventional? Yes, but that is exactly what we liked about it! Fast-forward to 11 months later and Portland is facing a very stormy Labor Day weekend. During a week with lots of rain, and more forecasted for their wedding day, Lindsay & Ethan begrudingly made the call to look for a venue with a bit more shelter. A few days before the wedding, their coordinator Nadia of Creations by Ly, found a stunning venue that matched perfectly with their original intentions of using a unique and creative space. 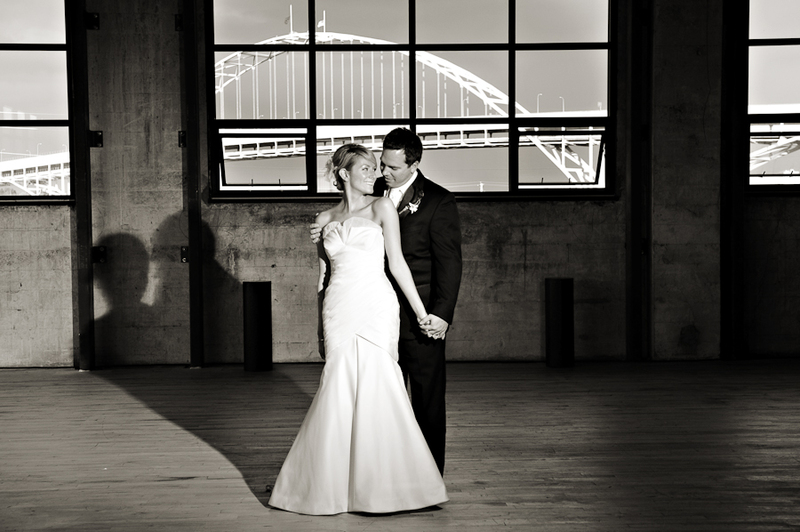 Their ceremony and celebration were held on the top floor of the newly-remodeled Fitzgibbon Glass Building, an open industrial loft with a commanding view of the Fremont Bridge. Everyone had a wonderful time enjoying delicious food from Simpatica, and taking in the view of the stormy weather outside complete with an evening rainbow stretching across the Willamette. The bride and groom celebrated with joy and grace, never hinting their week had been full of uncertainty and quick-changes! Click the photo below for more from this beautiful wedding! ‹ ‹ ‹ FS featured on the Wedding Chicks!